ART:21: Your work has often been described as ‘installation art.’ Could you talk about what an installation is and what it means to you, personally, to work in this way? HAMILTON: I think the form, for me, of working in installation is one that always implicates you actively within it. So that unlike an object, which we are very comfortable standing outside of and looking at, to work in installation is to work in relation to a particular place and all of the confluences and complexities of whatever it is that creates that (space). And so, as a viewer, to come in, it’s the experience the minute you cross the threshold: it’s the smells, it’s the sounds, it’s the temperature, it’s how all of those things have everything to do with the felt quality of ultimately what the thing becomes. I started in weaving, in textiles. I think that my first hand is still a textile hand in some ways, but I was very dissatisfied with the flatness that things actually had when they were done. It seemed like they were dead in some ways. And working, for me, in the form of installation in the way that I have, it’s that you’re coming in and you’re in some instances animating the space, and the process is often very social; for me, that part of it is very satisfying. There’s a way that it (the installation) has an ongoing life as it meets the public. Every moment that it’s up it’s different. It’s different from moment to moment, and somehow it’s that live time that’s just a factor of the form really, or something that is characteristic or inherent in the form is something that makes it continually interesting for me. It’s like there’s no real repetition in that time. Every day you’ll come in and every day it may be the same, seemingly, but within that there’s a difference and it’s only…I don’t know, I guess it allows that to be experienced and to be felt and registered. ART:21: And there’s also the way in which installations are impermanent, being specific to a particular place and time. HAMILTON: Well, certainly. It’s almost like the attitude about this space is not necessarily to alter it or deny it or erase it in any way, but to make present something that’s always here, make it more experienceable, perhaps. And part of that is its live time, and so the duration of that time means that it’s ephemeral in this form here. I don’t think it means that it can’t be reinstalled or have another iteration, but that will always be different. The experience of it will be different because of all the factors that actually give this the atmosphere that it has; it won’t be there in another situation or context. I suppose it is that live quality that is the thing that keeps it animate for me. You know, it’s that it’s never quite fixed, and so I don’t really think that it’s ultimately ephemeral. I mean, I feel like the video could be installed in a lot of different ways, and could take on different layers of meaning depending on whatever context it goes into. But it will only be like this once. Help welcome Professor Ginger Owen back from her sabbatical as she shares her artistic research from last year at September’s Art Hop. 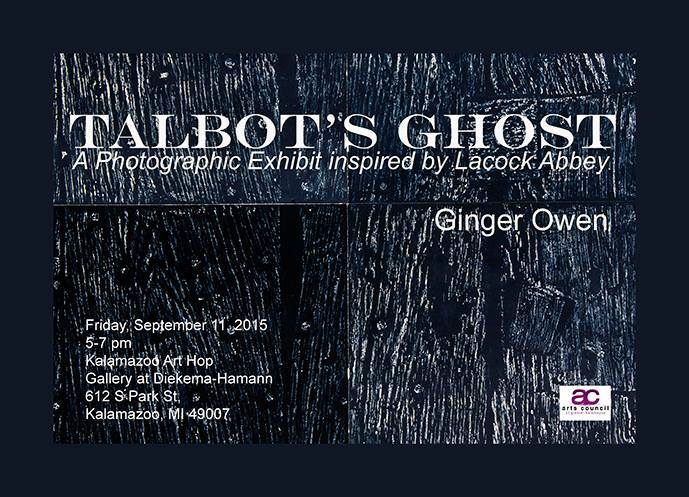 This exhibit will feature cyanotype and gum bi-chromate prints inspired by Ginger’s research at Lacock Abbey, Wiltshire, England. Lacock Abbey was the home of the inventor of photography, H. Fox Talbot. 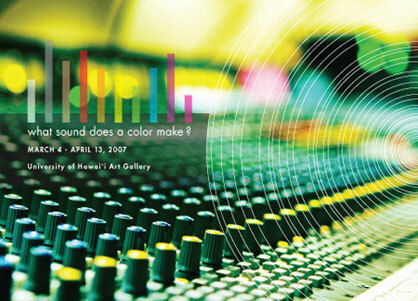 What Sound Does a Color Make? 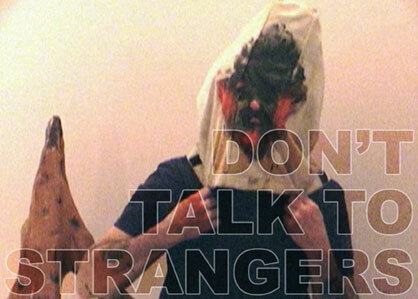 is an exhibition that explores the fusion of vision and sound in electronic media. Artists explore time-based work and manipulate sound with image, and image with sound, in videos and immersive sensory environments. 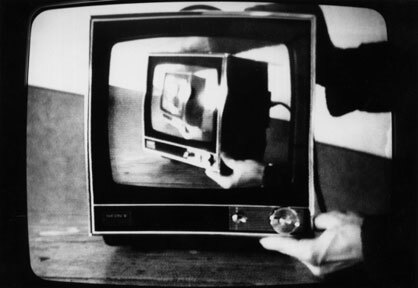 The exhibit connects the recent boom of digital audiovisual art to its pre-digital roots by presenting ten contemporary works by an internationally diverse group of artists and a selection of single-channel videos from the 1970s. Heightening awareness of human perception and cognition, these works hold interest for technophiles and general audiences alike. 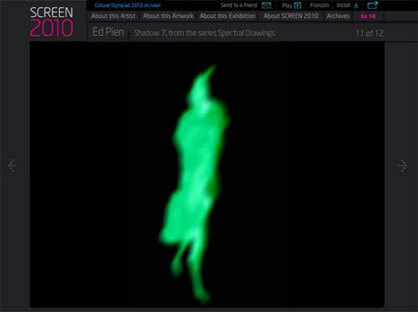 In one of the contemporary works on view, for example, made by a group of artists that includes Scanner (a.k.a. Robin Rimbaud) and D-Fuse (Kerri Elmsly, Mike Faulkner, Matthias Kispert, and Andy Stiff), the viewer is invited to bathe in a simultaneously soothing and stimulating atmosphere of electronic music and reprocessed video imagery. What Sound Does a Color Make? is a traveling exhibition organized and circulated by Independent Curators International (iCI), New York and curated by Kathleen Forde. The exhibition and tour are made possible, in part, by grants from The David Bermant Foundation: Color, Light, Motion; The Horace W. Goldsmith Foundation; and Institut für Auslandsbeziehungen e. V., Stuttgart; and by an in-kind donation from Philips Electronics North America.